In the District of Columbia, electrical, plumbing, asbestos abatement, home improvement and refrigeration and air conditioning contractors must be licensed. Complete and submit application to the appropriate agencies. 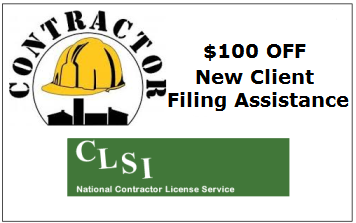 Submit corporate filings for both in and out of state contractors. Registration with Taxation and Revenue. Assist you in filling out your Certificate of Authority/Organization. Register your Corporation, Partnership, or LLC with the Business Registration Division including resident agent service. Continually work with you until your contractor license is issued.